When I eat a hearty meal with an egg on top! Finals week has prevented me from going grocery shopping, wreaking havoc on my diet. Suddenly I’m much more content to eat instant, quick-to-prepare foods. I’ve already had fried rice (3 times), ramen (2 times), microwavable mac and cheese (3 times), and frozen dumplings (5 times) on several occasions in the past week and a half. I’ve still been cooking from scratch! Just on much rarer occasions. At any rate, in an attempt to clean the fridge, I’ve also been reminded of one of my favorite foods: eggs. Generally, I try not to use eggs too often because of their high cholesterol content, but I’ve made an exception this week. I just polished off a classic finals week dish (ramen–mee goreng, in particular) that I made 5 times more awesome with an addition of a fried egg. 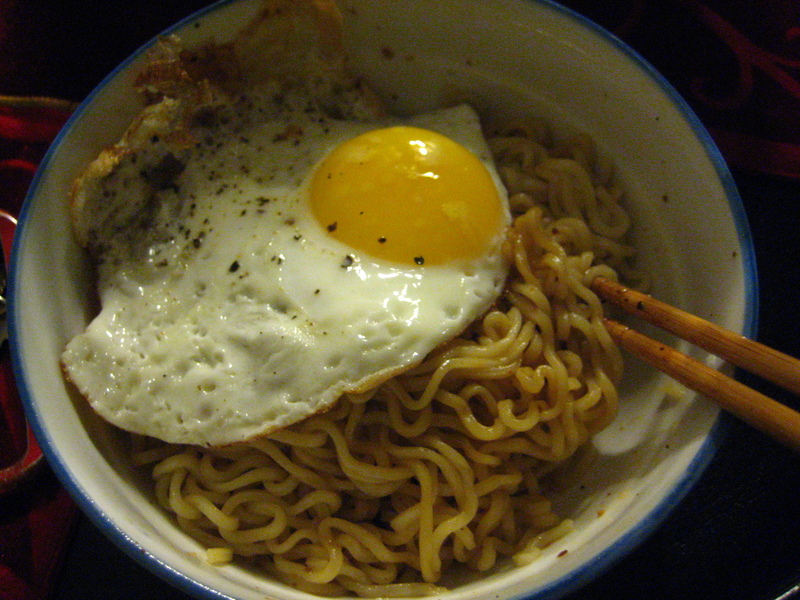 Instant mee goreng made instantly better: ramen noodles with an egg on top. Ah, what a difference a single egg can make! So next time you make a meal, try enhancing it with an egg. You’ll be converted for life. Oh man, this post makes me realize that I could never be a vegan.